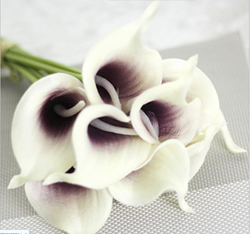 Artificial Flower Calla Lily ,White with Purple ,High quality Latex ,A bunch with 10 heads ,Free Shipping to worldwide area. Momda recommended trustworthy Supplier. Calla Lily Bridal Wedding Bouquet , White with Purple. Material: Latex . A bunch(includes 10 heads.